Last Meg Is In The Works! 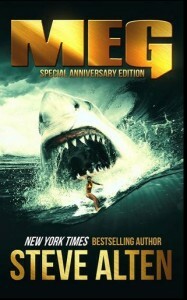 WHILE filming continues on the $150 million shark blood 'n' bubble dive feature Meg (starring Jason Statham, Ruby Rose and Rainn Wilson) author Steve Alten is busy writing his last Meg novel. It is the sixth book in his story about a prehistoric Megalodon Shark terrorising boaters, the military and undersea divers in and around the Mariana Trench. Alten sent me a newsletter on August 1st 2017 that says he has already written the first chapter of MEG: GENERATIONS. "The new book will feature 70+ readers who won a character contest" and will make name appearances in the book.